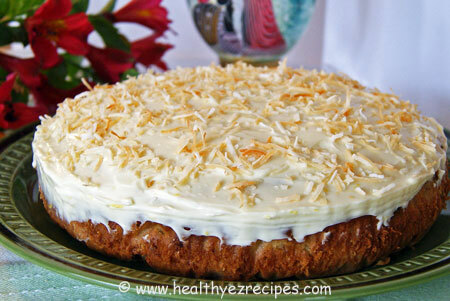 This coconut pineapple cake is the tropical version of carrot cake – except without the carrots. 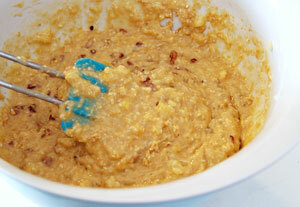 Instead it has crushed pineapple, mashed banana, coconut and nuts. In other words it’s full of all those yummy tropical ingredients that not only make cakes delicious, but also healthy. I’ve topped the cake with a cream cheese frosting, which only uses several tablespoons of icing sugar and I’ve used the lighter cream cheese. 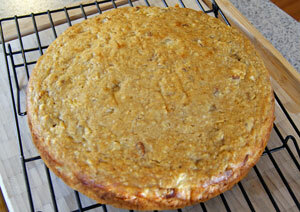 With the added lemon zest and juice, the frosting is very tasty, complementing without overpowering the cake. I found this recipe among my myriad of old cuttings and jotted down recipes. It simply needed a bit of tweaking, so I halved the sugar content, substituted some of the flour for whole wheat and added some nuts. I’m sure you’ll agree the results are simply divine. Grease a deep 22 cm / 9 inch round cake pan and line base and side with baking paper. Preheat oven to 180°C / 350°F. Sift both the flours and baking soda together in a large bowl. Add the sugar and coconut. 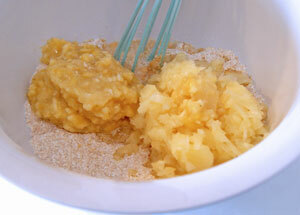 Give the mixture a good whisk to get rid of any lumps in the sugar. Mash the bananas in a separate bowl then add to the flour mixture. Drain the pineapple and add to the mixture. 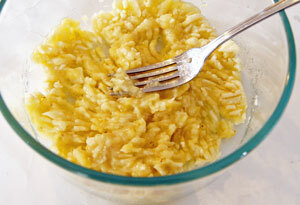 Stir in lightly beaten eggs, coconut milk and oil, mix until almost combined. Add the chopped pecans. 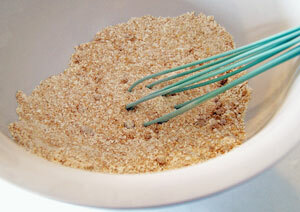 Continue mixing until the dry ingredients are thoroughly mixed and there are no streaks of flour. Pour mixture into prepared pan. Cook in a moderate oven for about 45 – 50 minutes or until cooked. To test insert a skewer into the center of the cake. It should come out clean. Remove from the oven and leave in the pan for 10 minutes. Turn onto a wire rack to cool. To make the frosting place the cream cheese in a bowl and beat either by hand or with an electric mixer until soft. Add the confectioners sugar, grated lemon rind and lemon juice and beat until the frosting is smooth and creamy. 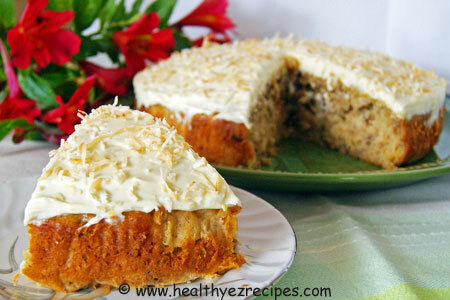 When cake has cooled spread frosting over the top and sprinkle with toasted flaked coconut. You can toast the coconut while making the frosting. But remember to keep a close eye on it as coconut cooks really quickly. Take the coconut out of the oven a few minutes early as it will continue cooking. By the time the frosting is done your coconut will be ready.